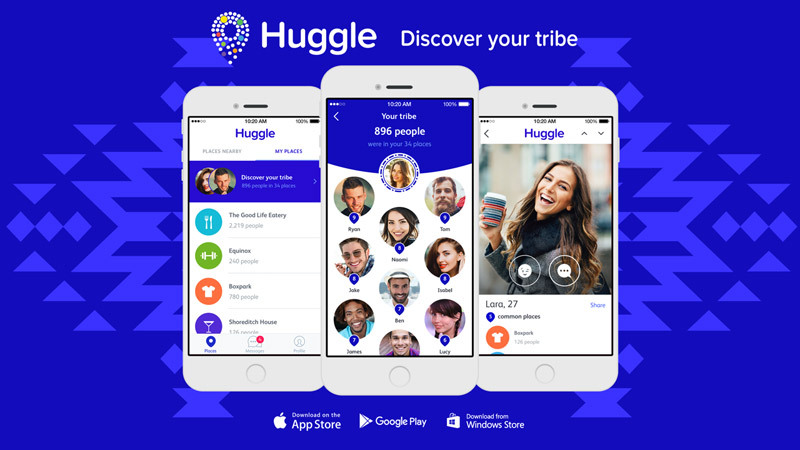 Huggle is the new social app that lets you discover and connect with the people who go to the places you go. When we’re young it’s easy to meet new people, the school playground often leaving us having a new best friend at the end of every day. However when you grow up, things change. Some friends move to other cities, some start full time jobs and others enter relationships. It can be really hard to make friends as an adult! Whether you’ve moved to a new city where you know absolutely nobody, or your workload is just to high to put the time aside to actually go out and meet people. If you’re on the look out for some ‘real’ friends, someone you can talk to and hang out with then Huggle is be the app you’ve been waiting for! Huggle works by connecting you to people who go to the same places as you. So if you are a fitness fanatic that’s looking for someone to grab a coffee with after your morning HIIT session, then Huggle will show you who else is working out where you are. Like wise if you’re an avid film fan – you can see who else hangs out at your local cinema! It’s a great way to connect with people you have things in common and share a similar lifestyle with. We’d like you to show the functionality of the app, focusing on the ‘matched via places in common’ function and how you would use this to connect with people in your everyday life e.g. : you met someone at a gig whilst watching your favourite band but got no name/number, just download Huggle, you’ll see who else has been to that place and voila, discover and connect! We’d like you to talk about this in a way that is truthful to you, in keeping with the Huggle brand. Huggle connects you to like-minded people at the places you love to go. Places in common is a great icebreaker and meeting someone who has similar interests or goes to the same places as you, is a great conversation starter. And of course, you’re more likely to get along with someone who has a similar lifestyle to you, than someone who you just like the look of. On Huggle you can only contact users if you have a place in common with them. This reduces harassment because people are less likely to send rude messages to those who go to the same places as them. Huggle filters who you connect with based on where you go, what you do, what you’re interested in and how you live your life. You are where you go, so let your lifestyle do the talking. Huggle has been praised for deterring inappropriate online behaviour. Huggle is the first app in the UK to provide safety features, such as it’s one minute photo verification and hyper-local technology, which automatically picks up users’ locations and stops fake check-ins. No random people can see your list of places only you! And you can only speak to people if you have a place in common. Huggle connects you via places. In a society that tries to eradicate bullying, physical shaming, racial and cultural differences, it’s astounding that apps encourage people to judge others by their appearance. At Huggle HQ we believe your looks do not say anything about who you are as a person, your lifestyle and interests do. Also open to anyone who is willing to write! Friendship is important to everyone, in all walks of life so we’d love to have you on board. The winners will be picked based on quality of content not popularity, so small/medium/big bloggers will all have the same chance.